← A taxi driver writes…. Through some internet jiggery pokery I am able to watch yer UK telly, okay, I watch X Factor, big whoop, wanna fight about it? One huge difference I notice is that every second advert is, and has been for a number of weeks Christmas related. I have to confess that I have a tendency to the “Bah humbug” end of scale caused in part by poverty, the endless build up and the “enforced cheeriness” of the season. I’m sorry but that woman in the accounts is still a miserable hateful ratbag even if she is wearing reindeer antlers. I have long favoured the crazy idea that we should try to be nice to each other for the other 51 weeks of the year. Okay, now that is out the way I can get on with the blog. I first came to Barcelona at Christmas to escape the madness described above and what I found, in all probability, cemented my love for the place. Christmas here is much more low key, the rampant consumerism is nowhere near as evident but this is much to do with tradition rather than any moral superiority. They genuinely do the 12 days of Christmas thing for starters, Santa Claus has an easy shift when he’s flying over Spain as the delivering of the kids main presents is sub-contracted out to the Three Kings who bring them on the evening of the 5th of January. This “spreading” of the festivities definitely takes a huge edge off the madness. That said, there is still some of the stuff you’d expect at Christmas, decorations, markets etc. so my point is more that spending Christmas here gives you the option to have as much, or indeed, as little of the festivities as you choose. I understand that Christmas markets have become a big deal in the UK in recent years. They seem to be mainly food orientated and I have to say I am somewhat envious of the fare that is dished up in many of these markets. Having a glass of mulled wine while leathering a roast pork sandwich sounds a fine way to ward off the “spree killing” emotions that Christmas shopping brings out in me. The markets here are more “craft fair” than “scran fayre”, the most famous, I suppose, being in the square at the front of the Gothic Cathedral, the La Fira de Santa Llúcia. As I said earlier it’s more a craft fair, selling traditional Catalan Christmas decorations. In light of the market’s location it may surprise you to learn that one of the most, if not the, most popular decorations is “El Caganer” best, and accurately translated as “The shitter”.. It’s a little ceramic doll of someone erm… coiling one off. In addition to the traditional design they often feature famous personalities “clearing their throats”. 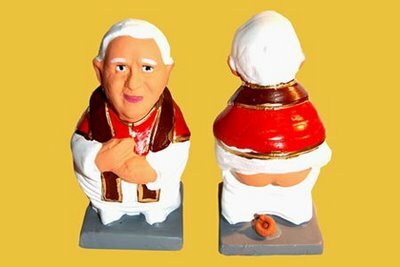 ( I received a report last year that, allegedly, there was one featuring Pope Benny dropping the kids off at the pool but I am inclined to dismiss that*) I’d suggest much like Ronco used to describe their tat in the seventies (anyone remember the Buttoneer?) they make a perfect Christmas gift for that special someone in the family. In terms of restaurants etc. Christmas Day is much like any other, most places will be open and it is unlikely that they will have hiked their prices up significantly, if at all. Obviously the usual tourist places are closed but a day spent wandering around the Gothic Quarter, in particular is never a day wasted. This may or may not show a fotie. Neither did that one. I am not good at this sort of thing. However, I shall be Christmassing up Gran Canaria, and find that the annual ” Get your festive lavatory paper/ corn plasters / haemorrhoid ointment NOW, while stocks last ” type adverts are not annoying me nearly as much this year. How come you do not have your website viewable in mobile format? cant see anything in my iPhone.